Like most people in the pro audio industry, I learned over the years how to work with a handful of common techniques for creating stereo audio: AB, XY, M-S, ORTF/NOS, Blumlein, Jeklin, binaural, panning of multiple mono tracks. Each has certain strengths and weaknesses; each has its place in the grand scheme of things. During the 1990s I experimented casually from time to time with ambient field recording using some of these traditional techniques. In 2004, after a long hiatus, I took up the challenge much more seriously, beginning with something that seemed to work fairly well for me in those early days: a pair of Shure Beta58 microphones that I owned, situated in an ORTF array. 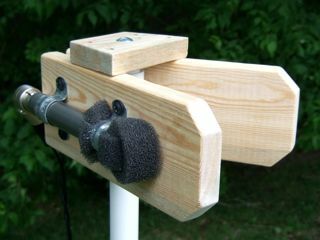 I also built a couple non-traditional experimental mic rigs that year. Those were colossal failures. I learned a lot from them, but the memories are too embarrassing to recount here. At that time I also joined the (now ancient) Nature Recordists Yahoo e-mail forum, where a lot of discussion soon developed about Shure WL183 lavalier microphones. These small omnidirectional electret condenser mics seemed to be well regarded by several group participants, so I ordered some and began tinkering with literally dozens of stereo mounting configurations using inexpensive, readily available materials. Little by little, through seemingly endless sequences of trial and error and hundreds of hours of careful listening, I began to discern many of the subtleties I was hearing from these and other stereo arrays, and how they translate to both headphones and loudspeakers. The more I listened, the more I wished I could capture greater depth and spaciousness in my field recordings. Spaciousness and depth were so dramatically improved that I immediately abandoned all previous experiments and adopted this as my new default approach. Unwilling to spend thousands of dollars for some of the most highly esteemed microphones on the planet, but still wanting to move toward higher quality and lower microphone self-noise in my recordings, I paid close attention when members of the Nature Recordists group began discussing AudioTechnica's modestly priced AT3032 mics (now discontinued, replaced by the new AT4022). 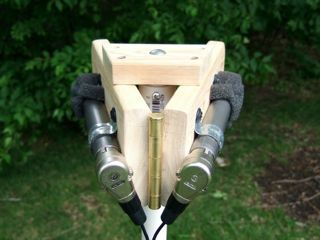 These small-diameter omnidirectional studio condenser microphones have extended frequency response characteristics, high SPL handling capabilities and very low self-noise (documented by group participant Eric Benjamin to be much lower than the manufacturer's published specs, and actually 5 to 6 db lower than many of those most highly esteemed and high-priced microphones on the planet). Stereo localization in these arrays is derived mainly by the setback distance from microphone capsules to the leading edge of the barriers. Barrier size is also important -- too small and the desired barrier effect is diminished, too large and unpleasant mid-frequency "bumps" begin to appear. The distance between the microphones will also affect the perceived width of the soundstage; there's room for variation here, but roughly "head-spaced," more or less, makes undeniable good sense and yields excellent results. Any angle between the barriers, inward or outward, will have its own effect. Each of these variables overlap with and affect all the others, so one must season to taste... wisely. 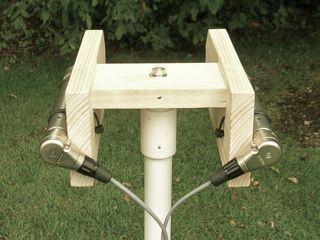 This "quasi-binaural" approach has become widely used by nature sound recordists around the world. I prefer it over coincident stereo arrays because it captures important arrival-time differences that aid in spacial imaging. In addition, these small-ish barriers seem to stabilize the stereo field, enhancing clarity and transparency by nearly eliminating those "wavy" microphone interactions that usually accompany traditional M-S, ORTF/NOS and spaced omni arrays. 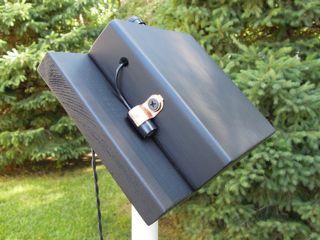 Being highly phase coherent, these barrier arrays also deliver excellent mono compatibility. Most importantly, this approach seems to capture considerably greater spaciousness and depth than any other traditional stereo technique I had worked with up to that time. Chronic tinkerer that I am, however, I stumbled upon a massive improvement in the spring of 2008. That's when I began experimenting with a radically unorthodox bottom plate structure that, to my ear, seems to further enhance spacial definition -- not just a little, but a lot. Note: These winged arrays have a definite upward orientation. If your target sound source is in front of the assembly, it's a good idea to tip it forward toward the source. Spacial definition doesn't seem to suffer from this. 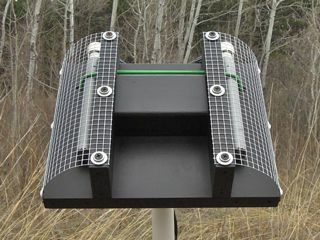 Another concept worth considering is the partially baffled boundary approach (PBB), made widely accessible in 2010 by nature sound recordist Rob Danielson. 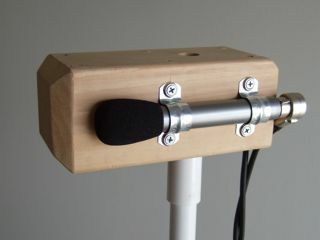 This is basically a "DIY" adaptation of the now defunct Crown SASS ambient recording system, using low-noise omnidirectional condenser microphones. 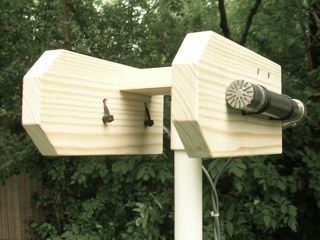 To my ear the PBB approach, with its flush-to-boundary microphone orientation, fails to capture key spacial cues that are a specialty of the winged arrays. The PBB effect strikes me as considerably "flatter," less natural sounding and much less vibrant. 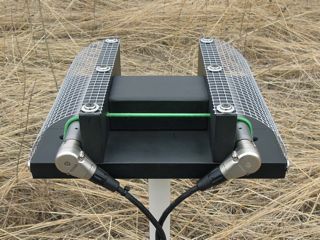 Nevertheless, the concept has gained traction with many nature sound recordists who appreciate the crisp articulation and deep "reach" of the PBB rigs. Here, as in most of life, we end up grappling with trade-offs and compromises, where choosing "this" often means giving up "that." 1. The photos and descriptions above are intended merely to suggest the basic concepts and show some construction possibilities. 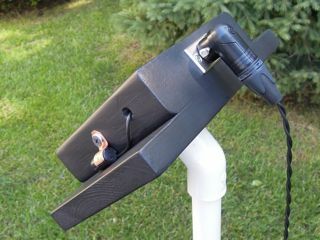 I offer no plans or specifications, as each particular combination of microphone model and construction technique will require its own adjustments. 2. 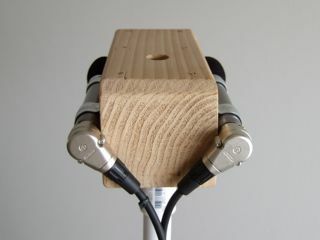 Counterintuitive as it may seem, cardioid microphones can also be used successfully in these arrays. Cardioids mounted this way seem to deliver somewhat crisper articulation of specific sound sources than omnis, but also a slightly "flatter," less spacious image. I sometimes prefer this for certain indoor recording situations. 3. Microphones whose housings are considerably larger than the actual capsule elements just don't sound right when placed adjacent to boundaries or barriers. Proceed with caution and "try before you buy" if possible.